This event is open to the public (IGDA membership is not required). A $25 participation fee is required. Parking is free. This fee goes to pay for venue costs. Computers and software are available upon request or you can bring your own laptops. There is a café on campus and shopping center nearby for food and supplies. Separate men and women rooms will be available for sleeping overnight. Just bring your camping gear! Participants may not use any previously developed concepts, code, or assets. Participants may not use any assets or code that is not free and open to public use. The maximum team size is 6 people. Participants may work independently. Participants must be present for at least 24 hours to be eligible for awards. Participants must complete and submit a game by 6PM on Sunday to be eligible for awards. A game jam is an event where pros and hobbyists come together to build a game in a set period of time, usually 48 hours. Participants are given a theme and set out to interpret that theme into a game in small groups. Do I need to be a game developer to attend? 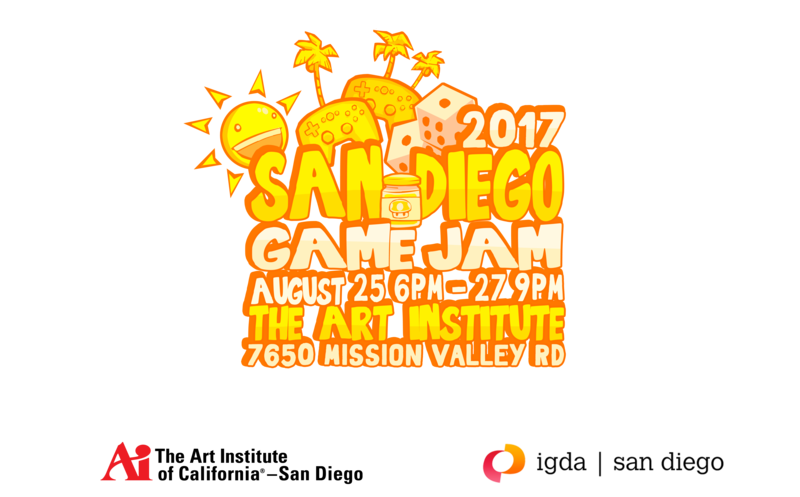 The San Diego Game Jam is open to everyone regardless of skill level. Digital or analog games are accepted. If you're not a programmer but have a great idea, turn it into a board game! To be eligible for awards, you or your team must stay at least 24 hours and be present during the submission period on the final day. Do I need to be an IGDA member to participate? This event is open to the public. No membership is required, but if you are an IGDA-SD member, you can participate for free. Participants must be 15+. Minors must be accompanied by a parent of guardian.